If a fuse has blown it must be replaced. – Identify the fuse for the failed component. 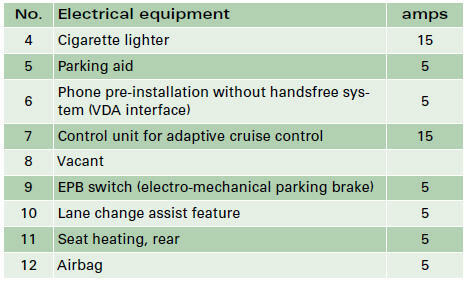 – Switch off the ignition and the component concerned. – Remove the fuse box cover ⇒ fig. 283. 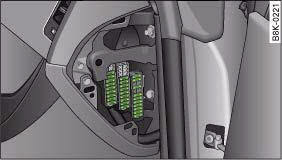 – Take the plastic clip from inside the fuse cover, fit it onto the blown fuse, and pull the fuse out. 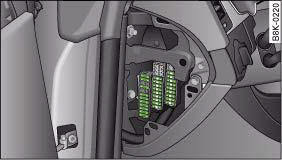 – Replace the blown fuse (which will have a melted metal strip) with a new fuse of the same amp rating. 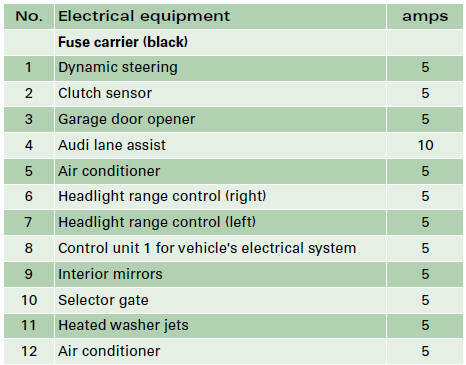 The various electrical circuits are protected by fuses. 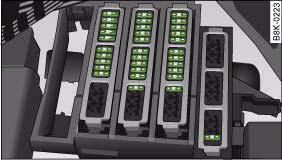 The fuse boxes are located behind covers on the left and right sides of the dash panel and in the compartment on the right side of the boot. 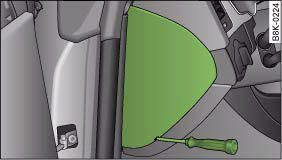 A plastic clip for removing the fuses is provided in the fuse cover on the left side of the dash panel. 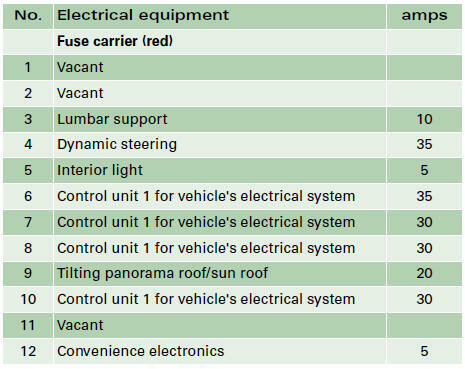 There is also a sticker listing the fuses in each of the fuse boxes in the dash panel. Never attempt to “repair” a fuse or replace it by fitting a fuse with a higher rating - risk of fire! It could also cause damage to other parts of the electrical system. 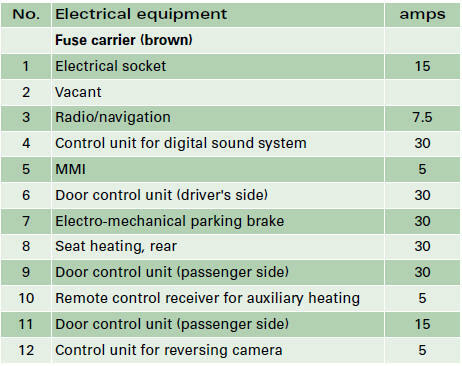 If a newly replaced fuse blows again after a short time, the electrical system must be checked by a qualified workshop as soon as possible. 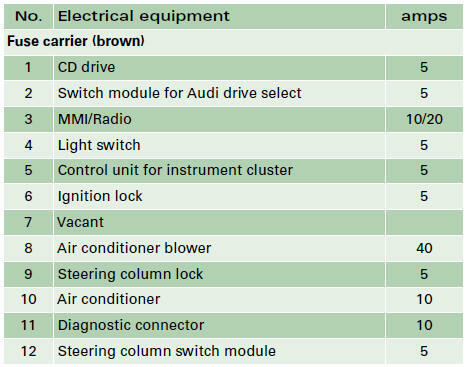 Some of the items listed are only fitted on certain models or are optional extras. 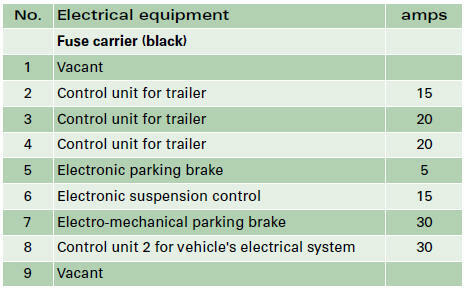 Please note that the following list, while correct at the time of printing, is subject to alterations. If discrepancies should occur, please refer to the sticker on the inside of the fuse cover for the correct information for your vehicle. 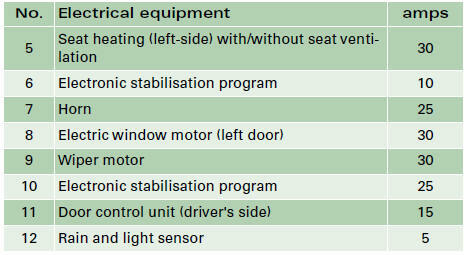 The seats with electrical adjustment are protected by circuit breakers. These reset automatically after a few seconds when the overload has been corrected. – Open the fuse cover.